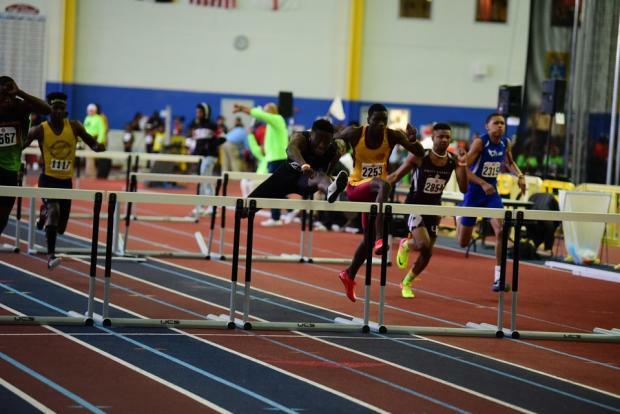 2019 AAU Indoor Nationals Recap: Over 60 Meet Records! On Sunday, the final day of competition, the events began with the 4x800m relay races. The Chester Cheetahs Track Club dominated the younger age groups with their 7&8 girls winning with a 14:23.11, their 7&8 boys running a 13:21.66 to grab the win, and their 10 year old girls racing an 11:55.73 to secure the national title. The 10 year old boys 4x800 title was won by the Delco Stallions team who ran an 11:55.23. The 12 year old 4x800m wins were attained by the 288 Track Club on the girls side (10:57.56) and the Morris Estate Track Club for the boys with a time of 10:47.21. The Bullseye Running Track Club 14 year old girls ran a 10:40.00 to secure their national title and their 15&16 year old boys ran a 9:04.68 to grab their age category. Also, the boys of Camden Clock Chasers ran a 9:52.68 to win their age category. The Ashburn Elite Track Club 15&16 year old girls raced an 11:06.18 to win their age group while yet again, Baltimore City TC dominated the 17&18 year old age group with their boys clocking an 8:31.08 to win the the title. Next came the 60m hurdles and dash finals, starting with the hurdles set up and the 11 year olds racing over them. D'Asia Duncan of Central CT Jaguars Track Club ran a 10.37 and Quincy Wilson of Virginia Elite Sports League ran a 10.24 to each win their age group title. 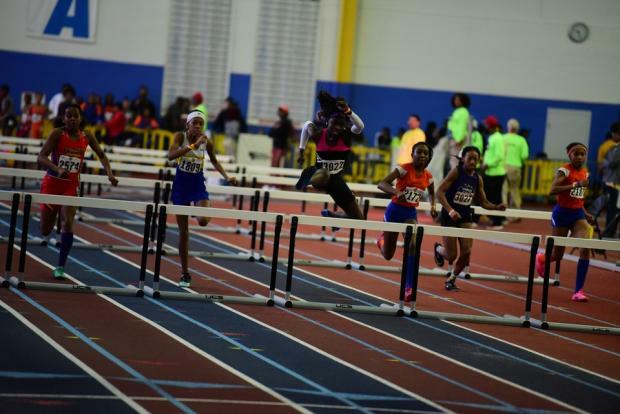 Shakayla Lavender (also with the Virginia Elite Sports League) ran a 9.54 and Josiah Teasley of the Full Speed Athletics, Inc. team raced a 9.82 winning them each the 12 year old 60m hurdle title. Jada Hatcher from Eight o Four Relays ran a 9.65 while Kobe Mack of the Tri-City Relays of North Carolina team ran a 9.28 and they both won their 13 y/o age group title. Akala Garrett or Purpose Driven NC Elite Track Club broke nine seconds (8.95) as did Carter Maffet (8.95) winning themselves the 14 year old age category win. Tia Taylor from Airy Track Club won the 15&16 hurdle finals with a 9.28 while Matthew Garrett won with an 8.65. In the 17&18 age group, Kennedy Jackson (Michigan Accelerators Track Club) ran a 9.01 and Brahmir Vick raced an 8.22 to win the age group hurdle titles. For the open and masters race, Shawn Davis of Above Xpectations Track Club ran a 9.94 to win the open title and from the same club, Jerome Holder raced an 8.54 to win the masters title. After the 60m hurdle heats concluded, the hurdles were cleared form the lanes and the 60m dash heats started. The 5&6 year olds ran first with Elise Pridgeon (10.45) and Deshawn Langley of Virginia Golden Army (10.28) winning titles in their age group. Next was the 7&8 year olds with Jasmine Wilson (9.48) and Dashaun Morris II (9.05) securing titles in that category. 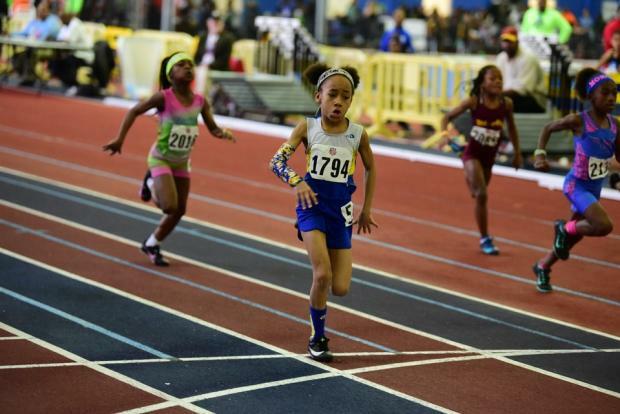 The 9 year olds raced next and Raniya Mathis of Glenarden TC with a 9.06 and Chandey Cross III Virginia Golden Army 8.63 grabbed the national wins in their events. Zion Bullard raced an 8.39 which put her at first for the 10 year old girls and James Patterson ran an 8.43 as he also grabbed the age group win. In the 11 year old heats, Londyn Atkinson from Track Xplosion won with an 8.38 (she also won the 200m earlier on) and Cameron Wade of Trial by Fire Youth Track Club hit 8.10 to grab the title for his sprint race. 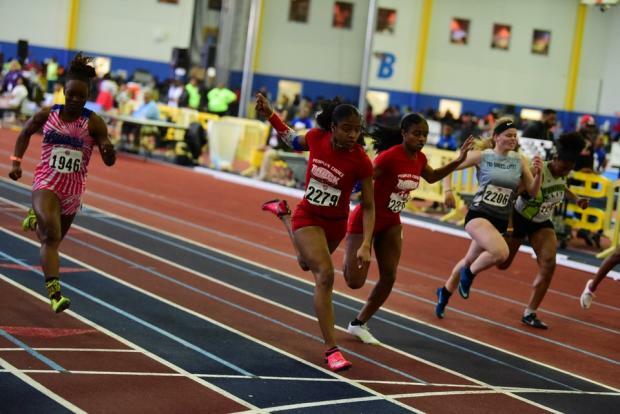 Payton Payne from Glenarden TC ran a 7.81 to win the 12 year old girls' title and Juliana Balon (Delaware Elite Track Club) ran an 8.11 to win the 13 year old girls' 60m title. Malachi James of CL Athletics Stars Track Club hit 7.41 to win the 13 year old boys' title. Jade Ofotan of Glenarden TC raced a 7.89 to win the 14 y/o girl's title before Marcus Brown (Full Speed Athletics, Inc.) ran a 7.42 to also win his 60m title. The 15&16 year olds came next with Micayah Holland of Global Transitions Academy running a 7.87 and Terre Robinson Jr running a 7.09 to win their age group titles. Jade Sabir of PeoplesChoice ran a 7.91 and Iven Dayton Jr. from the Trial by Fire Youth Track Club ran a 7.15 and each won their age group national title. For the Masters event, Anthony Ballard of the Port City Track Club race a 7.98 and Latoya Whitted from Track Xplosion raced 9.13 each winning the Masters' title. In the open 60m race, Philip Redrick from the No Speed Limit team ran a 7.06 to secure the win. The sprinting events continued as the meet transitioned into the 400m finals (semi-finals were on Friday). In the 5&6 category, Elise Pridgeon (who also ran and won in the 60m and 200m) raced a 1:20.64 and Caden Croom from Virginia Golden Army ran a 1:27.70 and they each won the age group title. For the 7&8 year olds, Alaiyah Choice (who also won in the 200m) from the Legion Of Zoom TC raced an 1:11.19 and Terri Woodard III of E.O.T.O. Elite ran a 1:12.63 as they both won their age category titles. Cherish Harley of High Level Track Club ran a 1:10.51 and Jaylen Brundidge from Unity Express Track And Field raced 1:07.50 as they each won the 9 year old 400m titles. Tiana Welbon from the Firebirds Track Club and Grant Reynolds from the Mark Trail Flying Eagles team ran a 1:04.56 and a 1:01.89 respectively as they each grabbed the 100 year old national title in the 400m. Damira Allen from the Chester Cheetahs Track Club ran a 1:00.64 to win the girls' 11 year old title and Quincy Wilson from Virginia Elite Sports League ran 59.96 to win the boy's title. 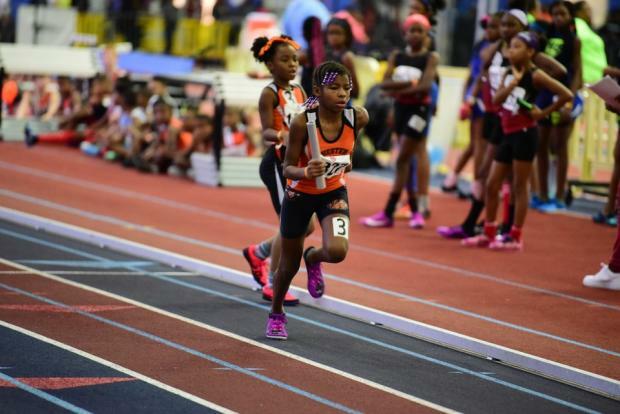 In the 12 year old heats, Shakayla Lavender (also from Virginia Elite Sports League) raced a 59.62 as she secured the 12 year old title while Christ Fitzgerald from the Real Deal Track Club ran 58.81 and grabbed the 13 year old 400m title. Also with a 13 year old 400m title win was Donovan Terry from My Brother's Keeper with a 56.59. Anissa Moore ran a 58.47 and Wesley Noble Jr. of the Metro Eagles Track and Field Club clocked a 53.48 to each secure the 14 year old national AAU title. In the 15&16 year old heats the title-winners were Caitlyn Bobb of the Bermuda Pacers Track Club ran a 57.44 and Talil Atkins from the Baltimore White Knight Track Club ran a 51.65. 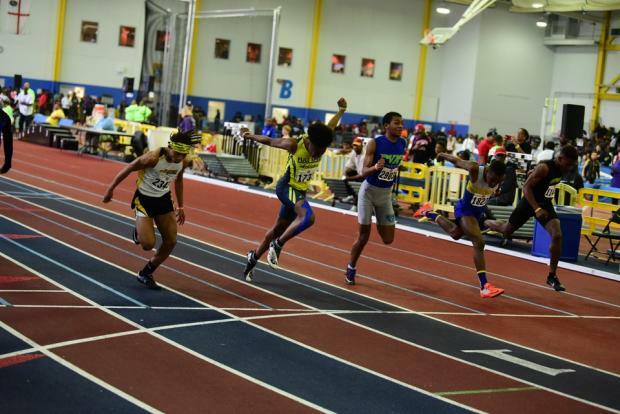 Destinee Mcleod of the Baltimore City Track & Field Club clocked a 58.73 and Jerry Philippe of Overtake Athletic Union ran a 50.97 as they each took the 17&18 national titles. In the masters section, Sarah Simmons ran a 1:36.05 and Jerome Holder (Above Xpectations Track Club) ran a 56.51 as they both ran title-winning races. In the open race, Bruton-Grinnage (also from Above Xpectations Track Club) raced a 50.74 that got him the win. After a couple of hours of sprint events, there were some more 1500m heats with the 7&8 year olds being the first. Leah Franklin of the Michigan Mustangs Track Club (who has dominated several of her races) ran a 5:56.59 and Alexander Riley from the V02max Track Club raced a 5:42.53 as they both won national titles in this event and age category. The 9 year olds were up next with Madelyn Ramirez of Ashburn Elite Track Club racing a 5:29.89 and winning the title as Mekhi Sharper from the Delco Stallions TC did the same with a 5:37.56. Anyla Robinson (5:26.76) and Grant Reynolds of the Mark Trail Flying Eagles (4:57.94), who also won in the 400m and the 800m, each won the national title in their age group. With the 11 year olds, Damira Allen Chester of the Cheetahs Track Club won her event with a 5:12.10 as Elijah Price of My Brother's Keeper did the same with a 5:07.56. Kimora Ruelas of the 288 Track Club finished at a 5:07.4 and Dhakir Brinkley of the Mallery Challengers clocked 4:59.93, winning them each a title in this age category and event. Last on the track was the 4x200m relays which was dominated by several teams. 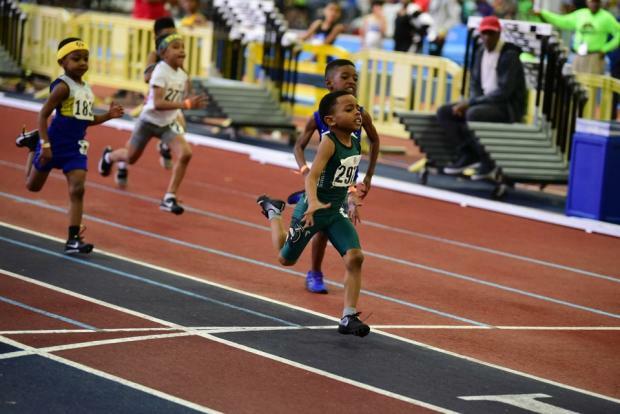 The Virginia Golden Army squad won many of the age categories including the 5&6 year old boys (2:46.41), the 5&6 girls (3:07.16), the 7&8 boys (2:15.73), the 10 year old girls (2:03.96), the 10 year old boys (1:55.84), and the 12 year old boys (1:50.43). The Baltimore White Knight Track Club took the W for the 7&8 girls relay with a 2:26.12. The 12 year old girls race was won by the Glenarden TC squad with a 1:45.64. The 15&16 4x200 age group was dominated by the Flying Angels team with the girls clocking a 1:43.94 and the boys finishing in 1:36.39. 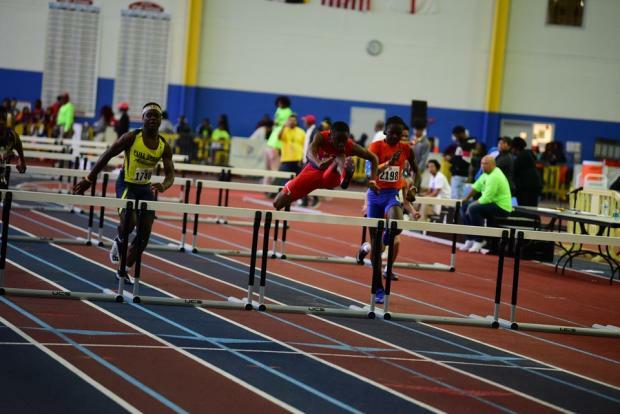 In the 17&18 4x200m relays, the PeoplesChoice team won on the girls side with a 1:45.32 and on the boys side, the Baltimore City Track and Field club won with a 1:32.06. These relays were a fast finish to a speedy meet, congratulations to all competitors on their accomplishments this indoor season and at the AAU Indoor National Championships!